Pretty makeover. And nice touch keeping the ribbon. Will look forward to seeing the bathroom. I love what you've done to the basket. It is amazing what a simple coat of paint can do. 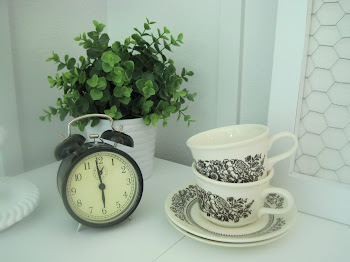 I have to agree with you there that one small thing can inspire you to redecorate a whole room! 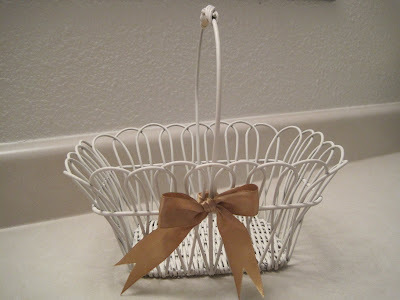 Cute little basket and looks perfect in white! You can use it anywhere! Very cute basket! What a great find! Love what you did with it! Big difference! 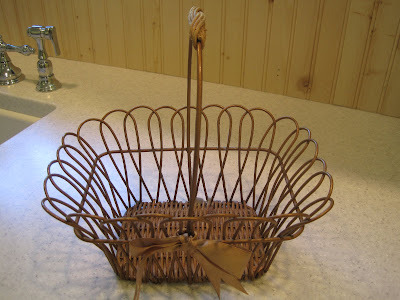 The basket looks great and I think a nice shade of oatmeal will look great in the bathroom. pretty basket. I can see the bead board in this pic too....it looks beautiful and very homey.